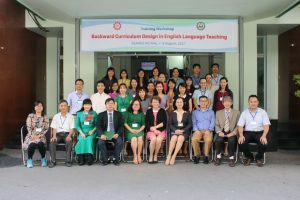 SEAMEO RETRAC in collaboration with Regional English Language Office (RELO) has successfully conducted the training workshop on Backward Curriculum Design in English Language Teaching for 30 lecturers of English from August 7 to 9, 2017. The training workshop was delivered by Ms. Amy Christensen, English language specialist, Central New Mexico Community College in Albuquerque, New Mexico, the U.S.A. The workshop sessions provided many interesting and useful demonstration of activities that could help participants design and apply them to the classroom practice effectively. 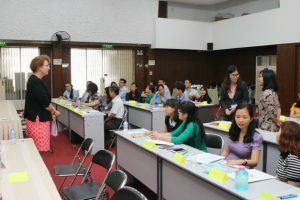 With great efforts from U.S. Consulate General in Ho Chi Minh City, Regional English Language Office (RELO), U.S Embassy in Ha Noi and SEAMEO RETRAC organization team, participants have appreciated this offer and look forward to seeing such valuable trainings for future professional development. We would like to give special thanks to our partners, US Consulate General in Ho Chi Minh City and RELO for your collaboration.